Sometimes we mamas can use a break. Am I right? A soak in the tub, a quiet cup of tea, and a good book. Sounds pretty nice, doesn’t it? These moments may be few and far between, but I’m here today to make that moment, when it arrives, a little more relaxing. All you need is a little salt, a few herbs, a muslin tea bag, and a few minutes. Put these together are you’ll have a rich, nourishing bath tea. 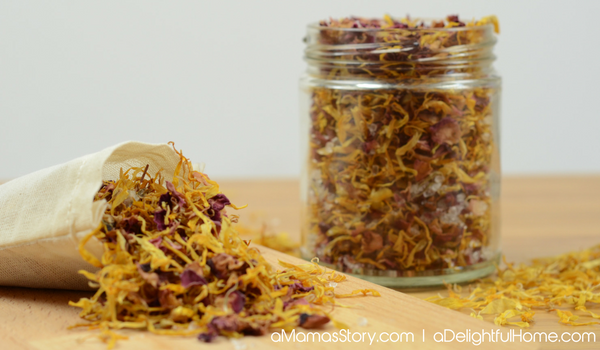 Bath teas have long been a favorite of mine; not just for myself, but also as a super quick DIY gift. (They always make an appearance in my speedy gift-making tutorials). I’ve crafted this particular recipe, especially for moms. It’s designed to provide skin-soothing benefits as well as target sore, tired muscles. Epsom salts are excellent for relieving stress and inflammation. It’s perfect for easing sore muscles, aches, and pains, and may help rid the body of toxins. A good Epsom salt bath on a regular basis is a great addition to any self-care routine. 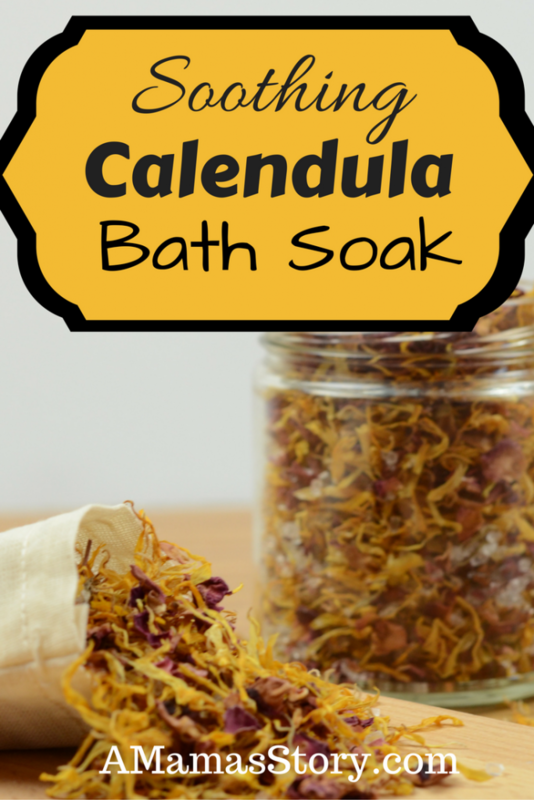 Calendula contains anti-inflammatory properties and is soothing to irritated skin. Some people with eczema and other skin conditions may find it helpful. Roses add a light scent as well as providing skin-soothing benefits. They are also anti-inflammatory, so work well with the calendula. Dried roses are helpful to have on hand for tons other DIY projects too. Lavender Essential oil adds a light relaxing fragrance. 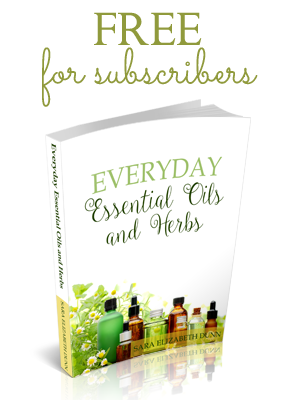 Another essential oil could be substituted. Just make sure it’s skin safe. You will also need small muslin drawstring bags. This is one of the easiest recipes you will ever make! Place the herbs and salt in a bowl and stir to combine. Add the essential oil and stir to distribute evenly. Scoop 1/2 cup of mixture into each muslin bag. To use: Tie the muslin bag to the faucet while the bath fills with warm water. Once the bathtub is full, untie the bag and let it float in the water. Relax and soak for 20 to 30 minutes. If giving as a gift be sure to include instructions. If you would prefer to keep the mixture in a jar (because it’s pretty), just scoop 1/2 cup into a muslin bag when ready to use. This recipe makes enough for three applications. 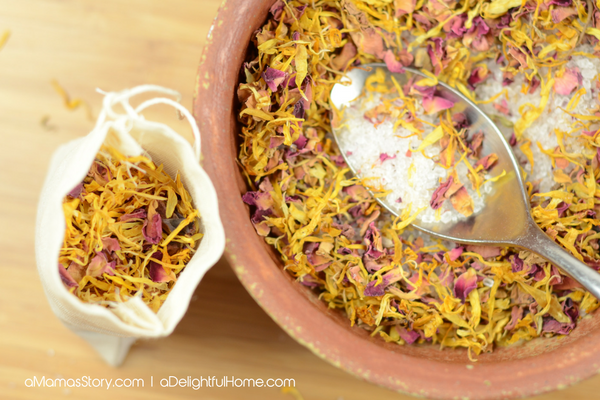 I hope you’ll try this quick and straightforward bath soak for yourself or gift it to a friend. If you enjoy making handmade gifts for friends, you may also enjoy creating a simple whipped body butter. 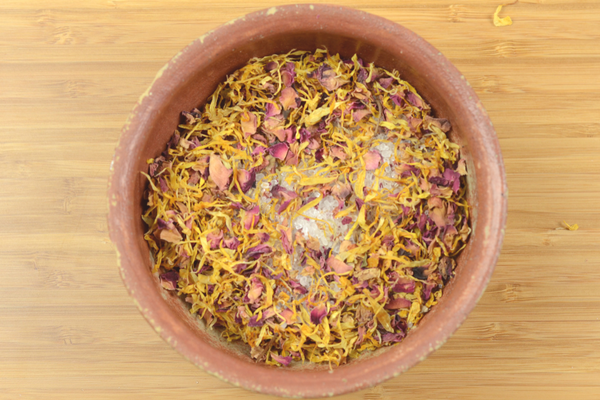 Have you tried calendula in your herbal medicine chest? If so, how do you like to use it? I’ve never heard of bath teas! Sounds very relaxing and a great gift! Bath teas are fabulous, especially for skin. Thanks for visiting, Heidi, and have a blessed week ahead.